An RAF veteran who began farming to help with his post traumatic stress disorder said he is devastated three of his lambs were stolen and slaughtered. The remains of the month-old lambs and a rare Lincoln Longwool sheep were found near Hall Farm in Messingham, near Scunthorpe, on Saturday. Jamie Quinn said the incident, the second in recent weeks, had left him afraid to leave his animals unattended. He said he was "sickened and angry" by what happened. The hand-reared lambs were taken from a barn, dragged through a fence, and slaughtered for their meat in a field opposite the farm, Mr Quinn said. He said "only their skins were left for us to find". 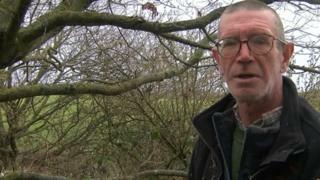 Mr Quinn said he also found evidence the thieves had strung up the lambs with barbed wire from a tree. The lambs, named Ethel, Chunk and Ugs, were triplets, and had been bought for a local school. "They had to be bottle-fed with formula milk four times a day because their mother could not feed them all," Mr Quinn said. "Since the weekend I have been dreading coming in - worried about what else I might find." "I'm loathed to be away." He said the incident had left him feeling anxious. Mr Quinn, who served with RAF force protection during the Falklands conflict in 1982, said the animals on the 100-acre farm, predominately cows, had helped him cope with his PTSD. "They stopped me feeling sorry for myself," he said. He said the lambs, which were bought for a school project, would now be replaced so the children did not miss out. Humberside Police said it was investigating a burglary at the farm on Holme Lane, adding it had stepped up patrols in the area.